EnergyCAP’s live dashboards make energy and facility data analysis easy and convenient. Individual users can build dashboards using widgets that display the performance charts and graphs most relevant to his or her job responsibilities. The comprehensive widget library covers a range of data categories, including accounting, energy management, sustainability, and facility management. 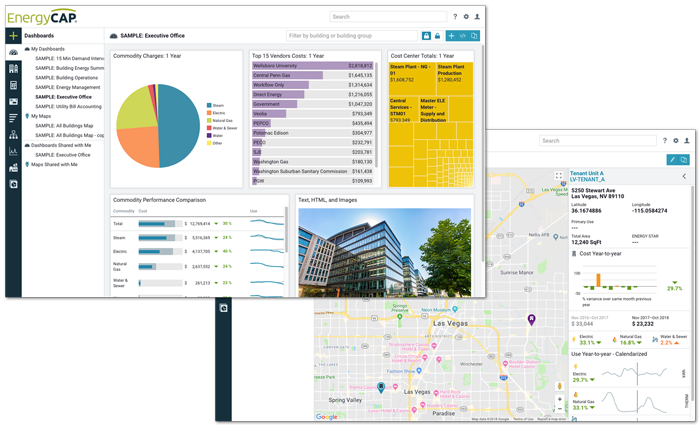 Map-based dashboards allow users to quickly view facility performance statistics and navigate to a facility for detailed analysis. A flexible widget allows users to add text and images using HTML to further customize their dashboards. EnergyCAP dashboards can be set up for personal use, shared within the organization, or embedded on public websites.